Today, we take a quick break from Disney and theme parks to stop over by our favorite aquatic haunting grounds (waters) and check out the Queen Mary. Now, I know you might be confused, because it isn't fall and Dark Harbor, or winter and Chill. But recently, the Queen Mary announced that it would once again be booking stays in its most infamously haunted room, B340. 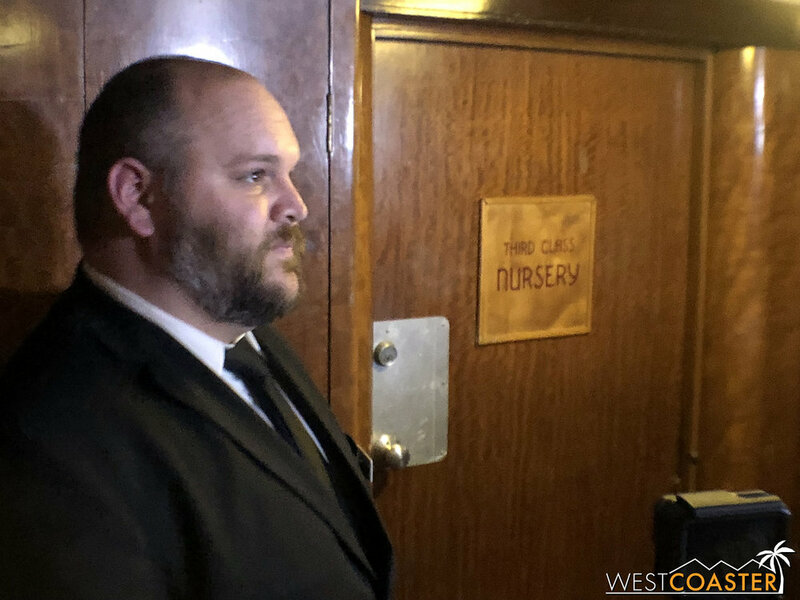 Last Thursday night, they invited members of the media--and also Westcoaster--to check out the restored digs and get a glimpse of the haunted tours offered on board. We sent our Senior Spoopy Subjects Correspondent, Jenny O, to go check things out, and here's a lowdown of what happened. Welcome to the scariest place on the Queen Mary... WHERE ALL THE KIDS GO!!! Well, all the third class kids. Apparently, children were pretty damn elitist back then. Fans of Dark Harbor will know the background story for the maze, B340, involves a Queen Mary Spiriti named Samuel the Savage who was a passenger with a known history of instability and violence. After being particularly disruptive during a voyage, he was locked in his room. But the next morning, he was found gruesomely dead, having apparently torn himself to shreds in a most particularly violent fit of madness. That's based on a true story, and while the specifics may not be quite as theatrical, room B340 on board the Queen Mary is one of the darkest and most sinister rooms on the ship--if not the darkest. Many guests have reported ghost sightings in this room, and heavy energy, with an atmosphere of rage. It was such an issue that the ship ultimately stopped lodging people in this room, sealing it up and away from the public. One of the tour guides tells a story of a time a ghost got touchy feely--except it was a ghost, so the feels went right through. To mark the impending reopening of the room, media members took a tour of the ship. The initial walk yielded ghost stories from various employees of the ship. And of course it would! The Queen Mary has been consistently ranked as among the most haunted places on Earth, and plenty of guests and employees over the decades have reported encounters with the supernatural. All of a sudden, the spirit of Norm apparates! What followed was an attempt to communicate with the ship's ghosts using equipment located in the safe room, located within the boiler area. There didn't seem to be any particular manifestation of hauntings on this particular night, but perhaps the specters were shy. Astounded tour guide is astounded. And here's the haunted hatch door! Finally, the tour concluded inside room B340 itself. Commodore Everett provided stories of his experience on board the ship and his close calls with the supernatural, as well as reports from others. Over the course of the ship's legendary history, some of these experiences have been rather harrowing! Of course, whether that's unnerving or not depends on your skepticism or belief in the realm beyond. Here is some video from within the tour, sharing some of the stories told. These are snippets of experiences guests can take at the Queen Mary, through a variety of supernatural tours offered. Be it the Ghosts & Legends tour, Haunted Encounters, or Attractions @ Night, there's a bevvy of options for those looking to get up close and personal with a spook. That concludes this quick little update from one of the most famous haunted ships in the world. It's an exhilarating opportunity to stay in its most haunted rooms, and any ghost hunters or spooky seekers should be quite eager to book a stay. Again, special thanks to our Spoopeh Queen, Jenny O, for taking the photos and video for this update. Can you believe she's still nice enough to hang out with us at these ghostly events, rather than join the cool kids? Yeah, we're not sure why either, but we'll take it!